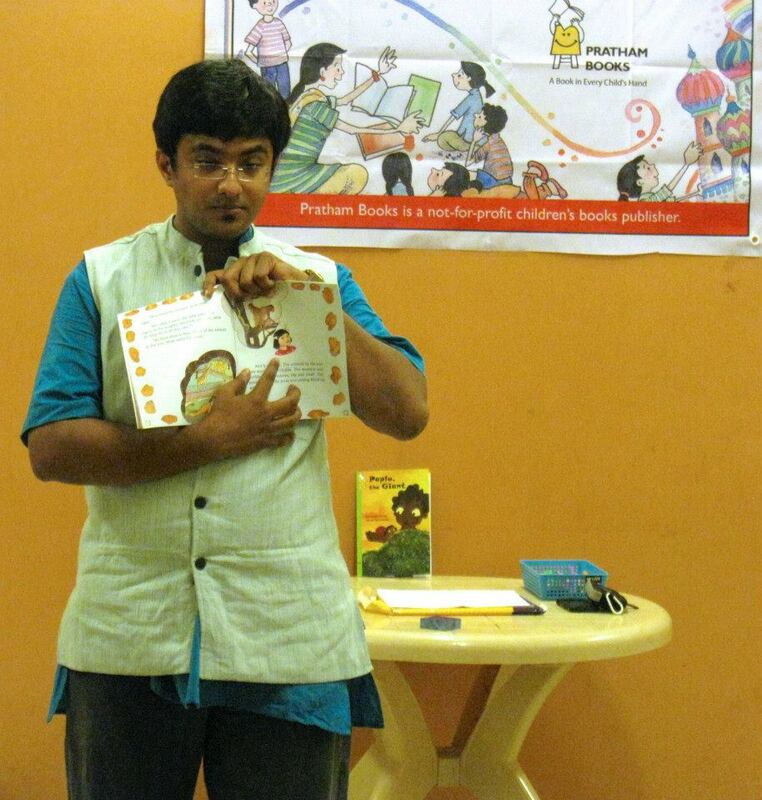 Vikram Sridhar conducted a storytelling session along with the Pratham Books (Bangalore) team on 7th September, 2013. Vikram is a person dabbling with multiple interest . 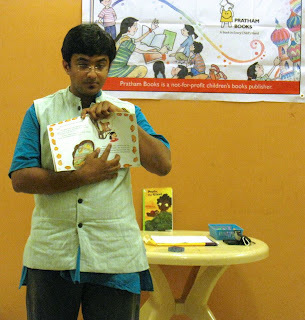 Vikram is a Story Teller connecting his interests in Theatre , Children and environment . He runs a Professional theatre group , Tahatto along with like minded friends and perform across Bangalore in other cities .Vikram tells stories at various public spaces and children gatherings . Apart from this Vikram works in the Marketing Space for an MNC . We would like to thank the Oxford Bookstore for being our venue partner and supporting us in this initiative. Language is not a barrier to share stories . A teller in English , sprinkled with few Hindi words . And a wonderful set of listeners who are used to Urdu as their first language but understand basic English . Connecting Paplu, the Giant and how he saved the village from the dacoits was just made easy by the sheer power of story telling and the interest in the children to listen and absorb bit by bit. At no point was there a disconnect because of the language as the teacher too pitched in . What began as a session in English turned to a multilingual one with Hindi and Urdu. And finally the children took the book and started reading ... Truly the essence of the day . Thanks to Pratham Books for this wonderful platform for connecting every child to a book. Thank you Vikram for spreading the joy of reading!